Tiffany's Online Finds and Deals: 48 Minifigures with 22 Accessories ONLY $12! 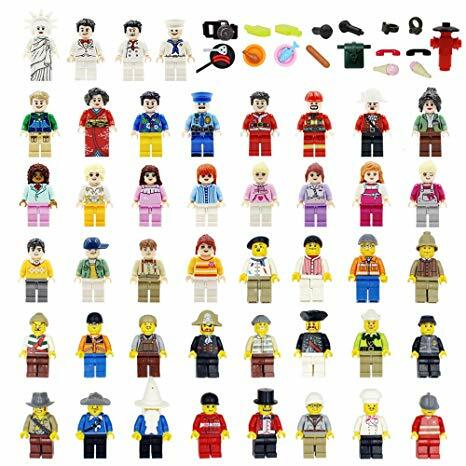 48 Minifigures with 22 Accessories ONLY $12! -City people have colorful expressions and realistic movements,Vibrant vivid colors as the pictures. -CREATIVE ROLE:provide real benefits to child's learning, from improved hand-eye coordination to enhanced problem-solving skills. They stimulate child's creativity and imagination. -PACKAGE:Every mini people is an independent packaging, can be more convenient to install. -SAFETY:Toy safety is very importan. All of our toys are made of the finest materials to ensure quality, safety and durability. -PRODUCT SPECIFICATIONS:This product is safe for ages 4 and up. Figures measure about 2 Inch H and perfectly work with all other major brand pieces but may not with Duplo.